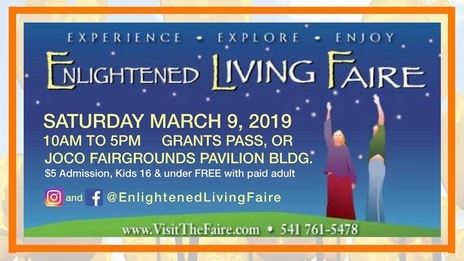 The Enlightened Living Faire is an inclusive, holistic, family-friendly community event in Grants Pass, Oregon held in March and October. It's been bringing together local healing arts practitioners - reiki, tarot, astrology, massage, body work, intuitive energy healing, crystals, jewelry, and many other wellness books, tools, and services, since 2006! 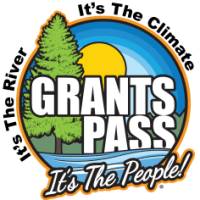 Join us on Saturday, March 9th, 2019, from 10:00am to 5:00pm at the Josephine County Fairgrounds in the PAVILION bldg, minutes from I-5 off Redwood Hwy 199 exit. Plenty of free parking. All-day Admission at the door is still only $5 for adults and kids 16 and under free with a paying adult. We look forward to welcoming you there! Please feel free to share this event with your family and friends. Visit http://www.VisitTheFaire.com for more information on exhibitors, about the Enlightened Living Faire, and more.